Custard Cream or Bourbon? Digestive or Hobnob? With this being the internet there is, of course, a website dedicated to this topic. In the office we, on a somewhat random basis, get free biscuits. It’s a limited selection and, as I work with a large number of people who aren’t that long out of university, the supply doesn’t last long. The biscuits come in mini-packs of three, unfortunately not mixed but three of the same kind. We have the choice of Bourbon Creams, Custard Creams, Shortbread, Ginger Snaps, Digestives and (as we recently changed supplier), Jam Rings! Whilst I’m partial to a Custard Cream, I am trying to watch what I eat and really don’t want three biscuits with a cup of coffee. Yes yes, I could eat them over the course of a few days but then you are faced with the prospect of having an opened pack of biscuits sitting on your desk, staring at you all day, demanding to be eaten, begging to be put out of their misery! The humanity! So, of course, if I do take a packet of biscuits I eat all three. I am not a monster. Like everything in life there is a hierarchy at play, and whilst you can argue about which biscuit is at the top of the pile (Custard Creams if you ask me!) there is no doubt that the lowly digestive is at the bottom of the.. er.. food chain. Or is it? Time for a vote! I would place McVities Rich Tea at the bottom of the BFC (Biscuit Food Chain). They’re not “rich”, and when you dunk them in your “tea” their structural integrity is insufficient to prevent complete deconstruction and a cuppa filled with swollen bits of soggy biccy. For sheer dunkability, you really can’t beat a chocolate Hob-Nob, or better yet, a Foxes Classic (the biscuit, not the bar). As Gordon will testify my favourite biscuit is a Viennese Whirl! Could and do devour a pack of six quite easily! As this is much too posh a biscuit for thr list, I have to go for the shortbread. Dean’s or my Mother-in-laws are the best! Cheap biscuits are a total waste of calories. And they are full of nasty ingredients. I just cannot see the point. On the rare occasions we have “catering” for meetings along with the overstewed, lukewarm coffee and not enough milk. The “caterers” supply the cheapest, nastiest biscuits in small packets of three. They are always too dry and aren’t really the real thing – sawdust biscuits instead of oatmeal, Jammy dodgers that seem to have been made with glue rather than jam etc. Ohh yes, I forgot. This is the internet, where every poll should include a “no I can’t possibly join in with this even though it’s a silly bit of fun” option. If not, I voted wrong… and I feel bad that I’ve voted so rashly, on such an important issue too! Gordon, I have, after many years of reading this blog, arrived at the conclusion that you should re-title it Dr Evil! How else could you have directed poor, guileless little me to a site such as biscuit paradise, which just so happened (coincidence or conspiracy?????????) to be highlighting an aberration guaranteed to send the anti-obesity killjoy brigade into paroxysms of righteous indignation, salivating at the prospect of yet another foodstuff they can deny the weak amongst us (for which read, the likes of me). Speculoos spread!!!!!!! I mean, after my initial astonishment that the obsession with this biscuit had assumed hitherto unimagined dimensions, I immediately dispatched the Hungarian to the supermarket to procure a sample for a taste test (all in the interests of dispassionate research, you understand…). Having unscrewed the lid, I pierced the hymen-like seal with my knife and plunged the blade in…It was delicious! Absolute perfection! A spreadable biscuit paste – argh! Yet another invention to shorten my lifespan! Not only that, but this whole sorry episode has also provoked an identity crisis. I mean, to have discovered something about this miserable, petit bourgeois, rain-drenched, miserable yet somehow inexplicably up its own arse little country that I actually like – after all these years!!! AARGH!!! The only suitable punishment I can think of for your crimes is to get you over on the next plane, tie you to a chair and force feed you with the goo for an entire weekend. P.S. I voted for Bourbon! My dearest Chameleon, I can only apologise but said spread wasn’t featured on that website until today. But by the gods I’ll be tracking some down!!! I reluctantly chose shortbread but was pouty about Kit Kats oo Cadbury’s Chocolate Fingers (True fact: Choco finger are as addictive as heroin*) not being on there. Does that make a me a biscuit brat? I voted for digestives. 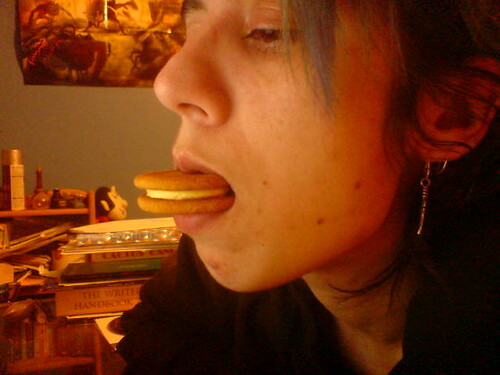 The salty sweetness of digestives is hard to resist. And it does taste relatively healthy so I’m sure some of those calories aren’t empty ones. One can surely only eat custard creams alone, as taking them apart and licking off the cream is so much of the pleasure. I don’t think the sort of little digestives you get in packs of three quite cut the mustard, you need the proper full size ones though. Hm. Maybe I should have voted for ginger snaps. That’s what I chose the last time I ate a pack of three biscuits. I ate them all too. But I’d just had half a litre of blood removed and I’d forgotten to eat breakfast, so I thought it was a good idea. I bought the book, you know (Nice Cup etc) a couple of years ago and read it in Venice. I will not even consider buying the speculoos spread because I think I would like it. Thanks for the compliment about my shortbread! I had to vote ginger snap although it’s only because that is the nearest to my real favourite which is a ginger nut. (No cheeky comments please) Anyone remember Chocolate Viennas? Triangular dark chocolate covered pink wafers – 6 words to describe heaven. You could pick the chocolate off and then eat the wafer layers 1 at a time – biscuits were still on ration at the time so you had to make them last….! I had to vote shortbread – mum (aka wife’s mother-in-law) does do the best – just a shame they only come out at Xmas time tho!!! A custard cream is my second choice – there is just nothing else out there hat tastes like it!! Good poll G!! I absolutely love shortbread – perhaps because the best ones are home made and only appear at Christmas (just like your mum’s), so it is a pure treat. Not quite sure what a ‘custard cream’ biscuit is, but think I would like it very much.